Smoke rises from fires in Kenya's Mau forest. The destruction of the canopy by farmers and loggers has triggered an environmental disaster - with millions of people downstream suffering from water shortages. Forest plundering is not a new issue in the Kenya scene. From the colonial period to present day, forests have been excised without notification or due regard to the affected population. Nevertheless, the 90s saw a trend emerge of exposing forest related issues through the media. Perhaps this is because the media is becoming aware of the importance of forest to the nation and what danger is imminent with the continued forest excision in Kenya. Unfortunately, though, most of the issues prominently featured have had little to do with human dimension of forests – forest people. A spot check of the Daily’s Newspapers in Kenya between 1990 and now, reveals articles and reports from consultants, lobbyist and reporters dealing with wider issues regarding forests. The issue range from conservation and management, excision to evictions of forest dwellers. While the pertinent issues have not emerged, what can be deduced from these reports are two concerns: environmental concerns of Kenyans and human rights of the forest people. However, these reports are events or crisis driven, unsustained, and hence reactionary. Above all these reports are also uncoordinated. “Forests are the earth’s lungs, helping to remove carbon dioxide and other pollutions from the atmosphere. They stabilize soils, reducing the risk of erosion and run off to rivers. They are in many cases home to a ‘rich variety of wildlife and indigenous forest dwelling peoples”. The Media also quoted the United Nations Consultants saying: Forest excision will impact negatively to two water catchments areas namely, Abardare circuit, and the Mau Hills complex. They warned that the exercise would ultimately affect communities in Nyanza Province and even the planned Sondu- Miriu hydro- electric power project. (The Daily Nation, Saturday March 10th 2001) The cost of excising forest has also been openly captured “Shillings 160B at stake in forest assault” reports the The Daily Nations, Tuesday March 06/01. This report, a product of the Kenya Forest Working Group (KFWG), which is a caucus of government and nongovernmental agencies involved in forestry matters. The working groups secretariat is placed at the East African Wildlife Society (EAWLS), Nairobi. This was the most incisive revelation of the consequences of the government’s plan to excise forests. In February 2001, the Environment Minister had proposed to hive off one eighth of Kenya’s 476,460 hectares of forest cover. The thirteen forests are the abodes of the Ogiek populations. These include; Mau complex, Nakuru, Nabkoi, Mt. Kenya, Marmanet, North Tinderet, Londiani, South Nandi, Molo and Kapsaret. The report provides a rational interpretation and projection of the loss Kenya’s economy would suffer in the event of massive alienation. This is a comprehensive report, in the sense that the consequences projected are broad based, thus going beyond environmental issues. The statistical back up of the reports suggests a catastrophe of gigantic proportions. For instance, they forecast that the loss of the forests would lead to a 22 per cent slump in Kenya’s national income. This derived from the fact that Kenya is a Ksh. 737 Billion economy. Again, the spiral effect will cost the economy Ksh. 165 Billion in the first year as based on the 1999 economic performance. According to the report, the projected loss is ten times the amount Kenya seeks from the World Bank and International Monetary Fund. However, the statistical projections exclude loss of water catchment areas, soil fertility and climatic stability which economists say “are difficult to quantify”. The report unveils overwhelming consensus by personalities, agencies of the United Nations and Non-Governmental Organisations interested in the environmental sector that the economy will suffer irreparable harm. Some of the effects would include, loss of jobs in the industrial sector and decrease in the national production of goods, negative impact on consumers and the economy, agriculture and power sector risk collapsing, rivers will shrink and die, killing hydro-electric projects downstream, benefits like availability of timber, fodder, fruits, clean air and medicinal plants will hence be significantly compromised and homes to a rich variety of wildlife and indigenous dwelling peoples destroyed. The report reminds that the power rationing plunged Kenya into economic chaos in the year 2000, which experts linked it to Pipeline Company consequently lost $55 Million (about Sh. 4.2 B) a month in revenue. A second case reported by the Daily Nation on the Tuesday 13/ March/2001 under the title: “Nakuru Rivers drying up due to widespread deforestation” indicated that clearing of hundreds of acres of forestland within Nakuru areas in rift valley had led to drying up of rivers supplying water to Lake Nakuru. This report brings to light issues related to deforestation, environmental degradation especially through chemicals and the link to the squatter problem. A World Wide Fund for Nature (WWF) official complaints that deforestation has led to water level problems to rivers Ngosur also known as Engashura River. The fund, he adds, is a conservation of soil project intended to stop runoff through construction of small retention dams at roadsides. Some of the problems brought about by government orders cited above include water shortages of residents, lack of grazing fields to animals and evictions of people tilling what seen as prohibited areas. The report is significant in its highlights of the dates it presents when the government ordered excisions. It also exposed the complex matrix of issues surrounding the definition of squatters, boundaries (undefined) of forests, establishments of new tree plantations and government performance of them. An official of 1,047 squatters within Dundori area of Nakuru, Mr Wilson Wangere attributes drying up springs to forest destruction. Forest destruction, the report reveals began in 1994 with the government orders that 200 acres of land be allocated to squatters. Amidst all these unanimity of opinions, the threats of forests excisions lives and rights of forest people violated. There has been consistent agitation against excisions between 1999 and now. However, these efforts came hot on the heels to an eviction notice or gazettement or excision plan by government. They are short in co-ordination and lack in follow ups making the government less committed in dealing with the excision. For instance on the March 10th 2001 The Daily Nation on page 4 of its National news writes: “Groups to block forest excision in court”, ”Stop this assault, Njonjo tells government”, “Damning report on plunder of woods”, “Allocation is opposed” and “Plunder of Forests”. From these many headlines, one is likely to be persuaded that Kenya’s Newspapers and people vigorously support issues to do with forest conservation and the environmental. However, on a closer look, what emerged on that day is that deadline on forest degazettement was fast approaching, hence the many headlines. Central Provinces. The application was made by 22 members of the Ogiek community residing in the Eastern Mau forest in Nakuru District. This is in continuation of protest against degazettement which the Ogiek perceived to be blatant violation of a court order issued in 1997 stopping further allocation. Mr. Kipkorir Arap Menjo, Mr. Kipketer Meli and Mr. Sammy Muter are the petitioners. All land title deeds being issued were to stop forthwith. “Ogiek vow to fight for their rights” writes (The Daily Nations, Mon 19/03/01) Newspaper. This article captures the formulation of a seven-person committee to spear head the campaign for recognition of the Ogiek’s rights by the government and the general citizenry. The Ogiek National Steering Committee, formed in Nakuru town, was to be assisted by two legal experts in indigenous peoples’ rights expected to lead their case in an International Court. The two, namely, Albert Barune and Fergus Mackay, both of Britain had attended the seminar with a purpose to enlighten the community on the rights of the community. The articles captures major event on the road to advocating for the rights of forests and forest peoples. Commentary: The above scenario epitomizes a reactionary status and dis-jointed efforts of consolidation therefore lacking in sustainability. The Report further argues that: “Licensing of saw milling in Kenya has become part of the system of political patronage in which applicants are rewarded provided they fulfil political requirements.” Beside the government owning all forested lands by law, there are no clear-cut policies governing operations and licensing of forest logging. “Saw mill allege bias in logging” reported The Daily Nations, Wednesday 05/July/00. The report brings to the fore conflicts in the saw milling licensing. Those with stakes claim bias is the operational rationale. Small scale Rift Valley saw millers challenge a ban imposed on logging accusing authorities of selective application. It also highlights (report) the publics of the authority concerned with the issue of such licences. As far as the saw millers are concerned, the conservatoire of forests bears the responsibility of issuing licenses and not a permanent secretary. They took issue with the government for allowing giant companies such as Rai Ply, Timsales and Pan Paper to harvest trees but barring small scale saw millers who employ more than 39,0000 workers. They also claimed that the big companies’ 70-ton lorries plying the Molo-Eldoret highway damaged roads posing the risk to other road users. Furthermore, some companies were flouting the ban on the movement of the harvested trees from one district to another. The report highlights problems regarding the regulation of logging in terms of policy and the lack of objectivity in implementation of the same to all parties within the same industry. Equally confusing are the two major activities going on in this country; the Constitutional Review and The Land laws Review Processes. In Principle, the two should inform each other. This is yet to happen rendering Kenyans more confused. Kenya’s Development agenda is also informed by recommendations of Poverty Reductions Strategic Plans (PRSP), which attributes Kenya’s poverty to lack of land; leading to many government plans to revolve around ‘land distributions’. In a report attributed to the Catholic Church appearing on the Daily Nation Sunday 15/July/01 under the title “Church queries state over forests” the Catholic Church questioned the true intentions of government officials behind the decree that more forests be excised. Archbishop Ndingi Mwana a Nzeki of Nairobi demanded that the government publish the names of squatters it intends to settle on the forests it intends to excise. The report claims, the catholic and the public would thus be able to assess the official motives for de-gazettement of thousands of acres of forests countrywide. The catholic church, in a paper presentation entitled “The church and politics; why the church cannot leave politics to the politicians”, adopts the view that all citizens have a stake in the affairs of the state, and as such, should be represented at all crucial policy making levels. Besides providing framework and operational guidelines to forest users, inhabitants and the public, the Government’s role comes out as that of an oppressive master. Through regular ultimatums, the government has thrown dialogue away and opted for the application of force in dealing with the issue of forest. “Vacate forest land, directs DC” Wrote the Daily Nation Friday 20/July/01. This article reports District Commissioner for Kericho, giving the order to those people who had encroached on Kibulgen Forest, a part of the larger Mau forest ,to vacate it. This included those who had constructed in it. This report provides the typical role of the Provincial Administration in carrying out executive orders and policies. Commentary: Kenya is depicted here as a country at across road. Major decisive political occurrences are taking place in the form of Constitution making, transitional politics, governance and Land law review. The public is left guessing and suspicion attends every government initiative. The government is seen not performing it role of policy promulgation, instead what emerges is a powerful government that uses its resources to cow its citizens to submission. Whenever excision are announced, human settlement is give as the reason. Most of the time, the reason given is ‘settling the squatters’. However this has been said and done many time without benefiting ‘the squatters’ rather it has been a covert way of land grabbing by the political elite. The Daily Nation on the Tuesday 13/ March/2001 under the title: “Nakuru Rivers drying up due to widespread deforestation” wrote that in 1994 the government had ordered that 200 acres of forest land be allocated to squatters. 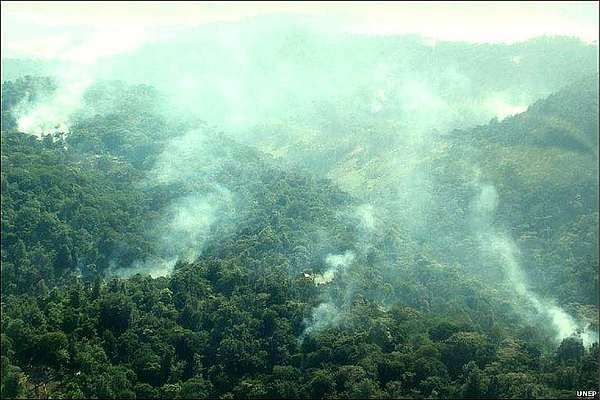 Hundreds of acres excised from Tinet forest were however allocated to politically correct individuals under the guise of settling those at the centre of the problem. This is why there is scepticism whenever the government announces de-gazettement of any forest. The Daily Nations on Sunday 15/03/01 under the title “Church queries state over forests” quoted the Archbishop Ndingi Mwana a Nzeki of Nairobi demanding that the government publish the names of squatters it intends to settle on the forests it intends to excise. The report claims, the catholic and the public would thus be able to assess the official motives for de-gazettement thousands of acres of forests countrywide. The report also provides the catholic churches’ views towards the general citizenry’s well being. It said that the human person, both as an individual and in the community has an inner dignity no political authority can take from him or her. No community can claim the title ‘forest people’ in Kenya as can the Ogiek. The Ogiek’s battle with authority over their ancestral land-forest is well documented. It begun in the colonial period, Ogiek were singled out because of their unique habitations style. However, in the recent past, the battle has stopped being a struggle for unique way of existence but now the whole issue is shrouded in the question of environment. Although this interest in the environment is well placed, but by providing for the rights of Ogiek, Kenya would perhaps serve its own environmental conservation needs. What comes out here is the dual role that indigenous peoples human rights protection and promotion serves. This duality in protecting the environment through human has not featured in the media and among environmental champions. No one has come out clearly to state that by excising the forests, the forests- dwelling- peoples ways of life is in danger. Equally, the government has not come out to say why it always targets specific forests like “the Eastern Mau, South Western Mau, Western Mau, Nakuru, Nabkoi, Mt. Kenya, Marmanet, Northern Tinderet, Mt. Londiani, South Nandi, Molo and Kapsaret.”(The Daily Nation Sunday 15/July/01) These are the forests mostly habited by the Ogieks. Is this a deliberate attempt by the government to decimate the community? In the report by the Daily Nation Newspaper of Friday 30th July 1999.under, the title “Government is against Ogieks, advocate tells court”, the seriousness with which the government viewed the Ogiek land issue was challenged in this article, which covers a court petition, case by the Ogiek. Lawyer Joseph Sergon for the Ogiek claimed that the rights of the Ogiek to life and livelihood as enshrined in the constitution was threatened by the provincial administration. The Rift Valley provincial administration’s decision to revoke all land allocations to 50,161 members of the Ogiek community yet leaving the allocations to the Kipsigis and Tugen communities in Tinet forest is considered discriminatory. The court application that the report covered sought a review or nullification of the revocation of land allocations by the administration. The revocation was in disregard of the fact that the Ogieks had occupied the land since time immemorial. This application was ultimately dismissed. Countless court cases have featured since Ogieks started challenging different excisions attempts. Prominently these court cases have captured by the local Media but no lasting solution has ever been reached. For instant Thursday 29th July 1999 the Daily Nation report under the title: “Diocese enjoined in Ogiek land case” The Ogiek land case being heard in court continued to attract sympathetic parties like the catholic church that succeeded in being enjoined as party in the case where the Ogieks sought to stop the government from evicting them from the Tinet forests in Rift Valley. The report cites a 1937 Kenya National Archives and documentation record showing the number of Ogieks living inside Tinet forest. On the 6th May 2000 under yet another title the Daily Nation, report: “Ogieks eviction stopped by court” the report was about a decision made by three appellate judges to stay the eviction of the Ogiek community from Tinet forest in Nakuru pending an appeal made on the same eviction defending the Ogiek, Mr. Mirugi Kariuki produced 1936 population census from the national archives showing their number to be 140 to indicate their occupation of the forest. Amidst all these court cases, no permanent solution has ever been achieved. What comes out is that the Ogieks are being blamed for all the problems afflicting them to day. In a classical case of ‘blaming the victim’ was presented in court and reported by the Daily Nations Friday 10th December 1999 under the title: “Ogiek rejected land, counsel tells court” This report revealed the historical problem of the Ogiek struggle with their dispossession of their land. It is not a new phenomenon. Mau forest resulting in another eviction in 1956. They were re-evicted in 1977 but still went back. The report further reveals that a committee was formed in 1929 to look into the issues affecting the Ogieks and recommendations on how best to resettle the Ogieks throughout Kenya and not just in Tinet forest only. This report captures the persistence and protracted nature of the Ogiek land crisis, emphasizing the fact that none of the measures adopted could resolve the problem since the Ogiek considered them unsatisfactory. The Government role in the human rights issue in relations to forest people and other related issues was featured in the Daily Nation on Tue 13th April 1999 under the title: “Government accused over human rights” The report is a criticism of the governments failure to incorporate into the country’s laws any aspects of protecting human rights. Many international human rights conventions it signed and ratified but yet to transform and or domesticate them into national laws. This, was said, contributes to lack of recognition of the same by the Kenyan courts. This was unveiled in a two-day workshop by the standing committee on human rights (Kenya) in Nairobi. In an ideal situation, the conventions are supposed to be debated on in parliament and enacted, soon after passing through the cabinet paper and signing stage. This is to ensure that the Conventions are enforced locally. This would be useful since very little legislation happens in the Kenyan parliament. A legislator, Josephine Sinyo, the disabled peoples’ concerns had not been legislated upon. The same was reflected of other minorities concerns as those of women. The role of Media in advocacy is clearly demonstrated. The Media can be relied on in dissemination of information, if the information is issue based and the purpose is of engendering public debate. It noted that such information requires follow up especially dialogue, which this case has not generated. The role of policy makers is crucial in redressing the issues in question. This is where both availability of the right information, understating the right issues and lobbying can serve the debate. The role of international lobbying groups is important, especially as far as lending credence to the issues is concerned. unending problems is underscored in this analysis. Policies framework and political stability are the two indicators cited. What is the government is not reflection on is that it is directly responsible for lack of policies to tackle the problem. Equally important is ratifications of international legal instruments that have guided and served many nation through similar if not worse problems. The lack of unified vanguard to push for the recommendations all the time reached in different forum in noted in the analysis. The multiplicity of CBOs, NGOs and Consulting firms dealing with the problem can be deduced from this analysis. It is a good sign if they are issue based, however this is not what is happening in the analysis. Duplicity of role by these organizations crowd and renders the advocacy being mounted useless. Beside, the reactionary nature of intervention makes the work by these organizations unsustainable. In the Ogiek case, the media highlights have largely failed to take advantage of the media’s capacity to inform the public, as well as influence policy, owing to the fact that the expose have largely been crisis oriented. This means that as soon as there is an apparent lull in the crisis, i.e excision, then the Ogiek issue fizzles out of media attention until another crisis restarts it again. The media debate that will have the necessary impact must be sustained and focused.